The top section of Chapel Hill (Nos. 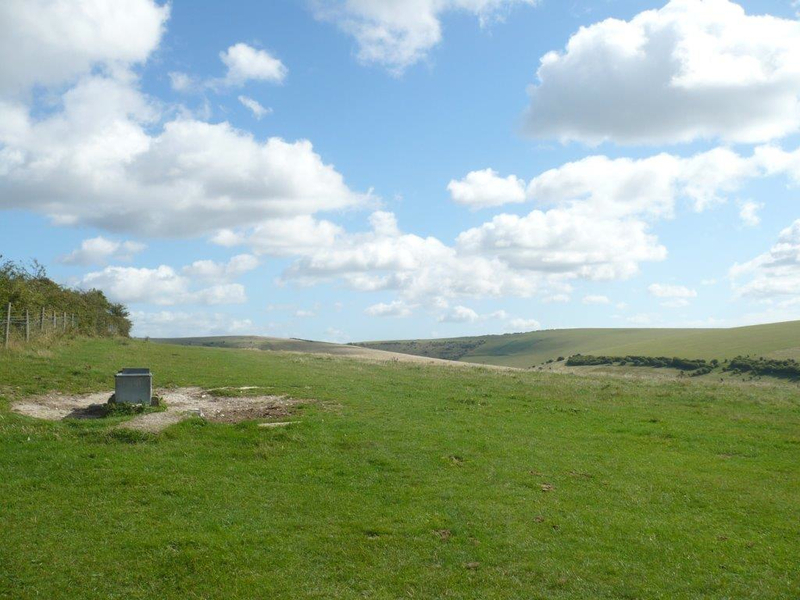 17-23a) lies in the Parish of South Malling above the parish boundary stone and the site of the Old Chapel. Research into the history of these properties has been hampered by lack of precise record-keeping and above all by the lack of house numbering – until the census of 1901. 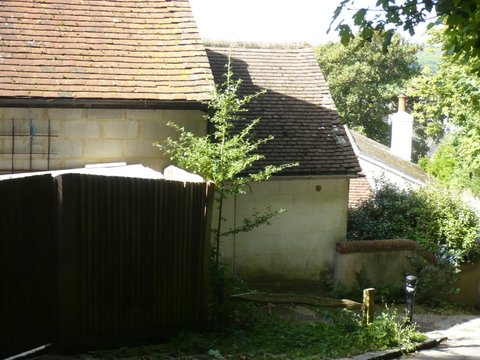 Next to the Chapel, are two cottages, after 1861 known as Briar Cottage and Rose Cottage, apparently built together, in brick and flint, possibly as early as 1814 when a reference was made to the ‘garden east of the Chapel’. The 1851 census is the first definite record. Above them are two or two and a half further houses where there have been many changes, some still a mystery. Opposite (i.e. on the right hand side of the road going up) is The Cricketers’ Arms referred to in the Introduction. Above the Cricketers’ Arms is ‘Prospect Cottage’ first recorded in 1870 though the date of the rear of the house may be earlier. On the 1899 OS Map, some 25 years on, we see the Chapel replaced by several houses and workshops (as described in the previous section). Above them, shaded orange, are Briar Cottage and Rose Cottage (Nos. 17 & 18), then three houses all in line with the road. These houses are first documented with any certainty in the 1881 census with the names: Elm Cottage, Hillside and Rock Cottage. In the 1901 census they appear only with numbers: 19, 20 and 21. The names were used periodically until 1936. Reference was also made to a fourth dwelling: ‘Cliffe View’, from 1887 – 1934 but it is unclear where this property lay. The photograph to the left is from the early 1900s (with thanks to John Davey). You can see the boys leaning against one of the cottages built on the site of the Chapel (No. 16), beyond that Briar and Rose Cottages (Nos. 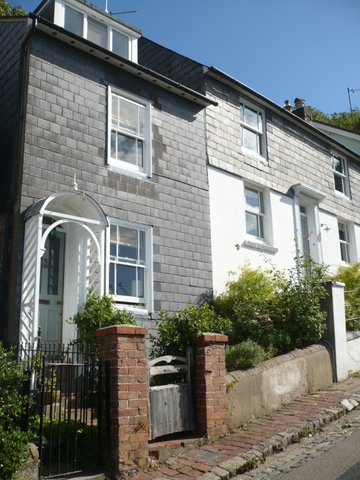 17 & 18), then the three substantial gabled houses in line with the brick pavement (which is still in existence). Note too the cobbled street. 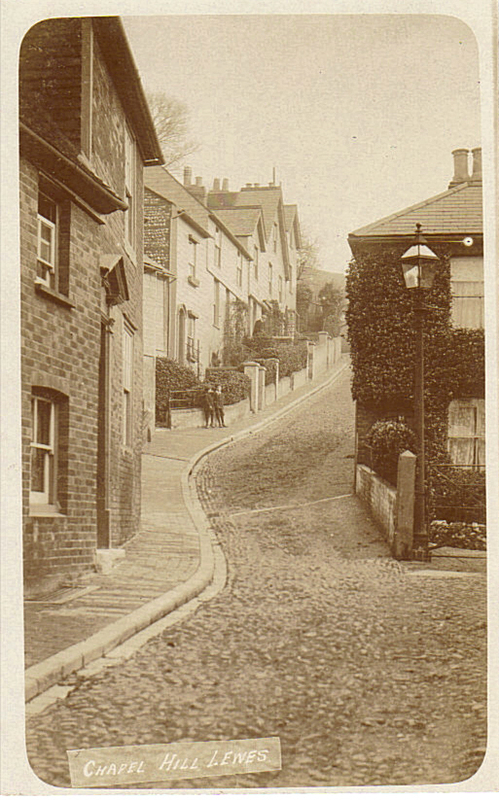 The photograph below is from the 1920s looking down the hill with these three houses on the right of the picture. 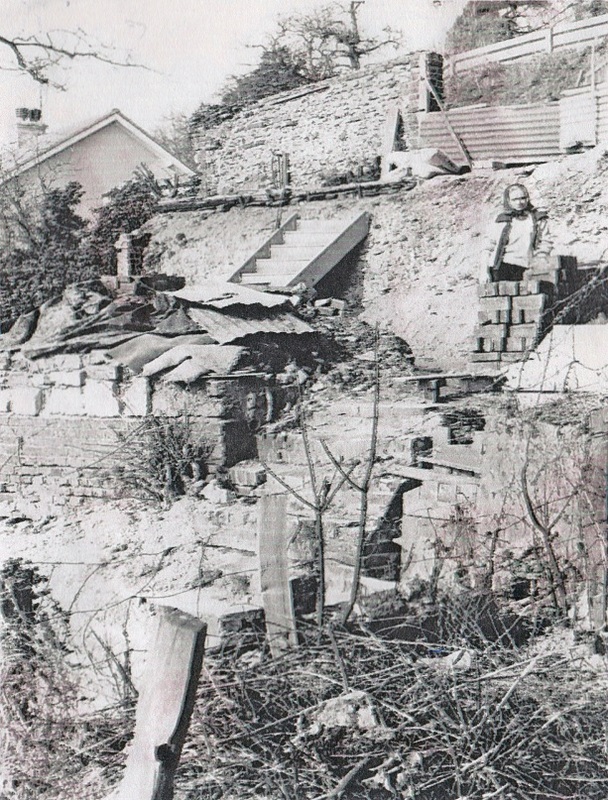 Note the flat land opposite where now (due to the steady erosion of the cliff) the land drops away steeply to the gardens of South Street below. 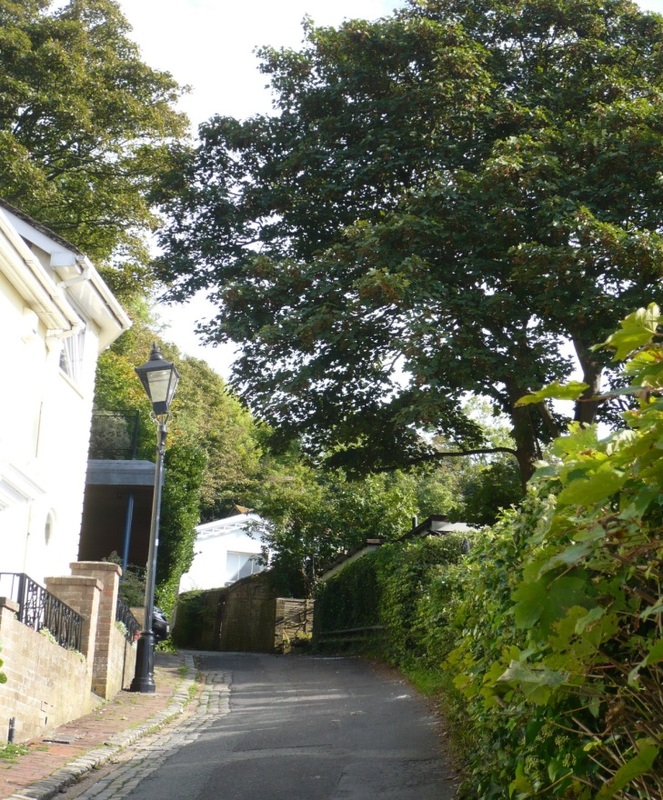 In this group of houses (left hand side above the Chapel site) it was the HOEY family that dominated during the second half of the 1800s and the early 1900s with different family members owning or renting in most of them. A Mary Ann Hoey, Head of Family at age 72 is first mentioned in 1861. Edward Hoey who owned No. 17 worked as a plumber with other family members in the painting-decorating businesses. Trades recorded in the houses generally reflect the local industries: a foundry worker, bricklayers, railway clerks, laundresses, a nursemaid, a tanner’s labourer, a butcher’s journeyman, a groom, a draper’s assistant – and one ‘lady with private means’! Occupancy in the 1920 and 30s was very stable in this section of houses: the names of house owner/occupiers possibly of interest to Lewesians are: Hawkins, Kent, Parks, Mepham and Funnell. This was the situation at the outbreak of WW2. There is then a gap in Pike’s Street Directories with no directories until 1951 when there is no entry for any of the three houses. 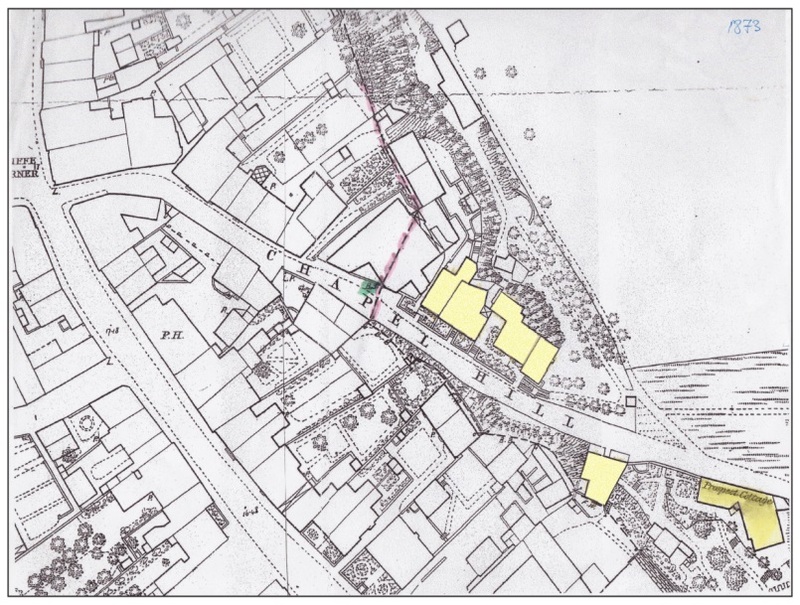 In a 1952 planning application, there is a reference to two demolished cottages, Nos. 19 and 20. 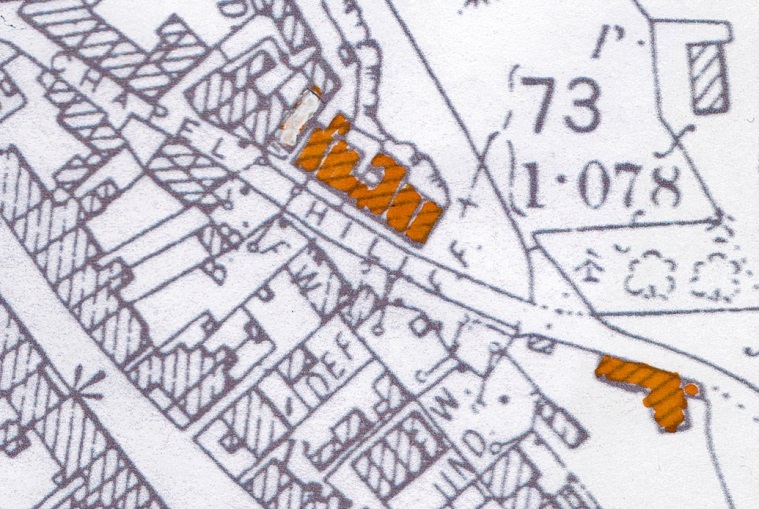 On the 1955 OS Map, the properties are no longer shown. Moving to the present, the following two photographs show the group of houses as they exist today. On the left is Briar Cottage (No. 17), slate fronted, and Rose Cottage (No. 18) with stucco. In the next photo are the two houses, Nos. 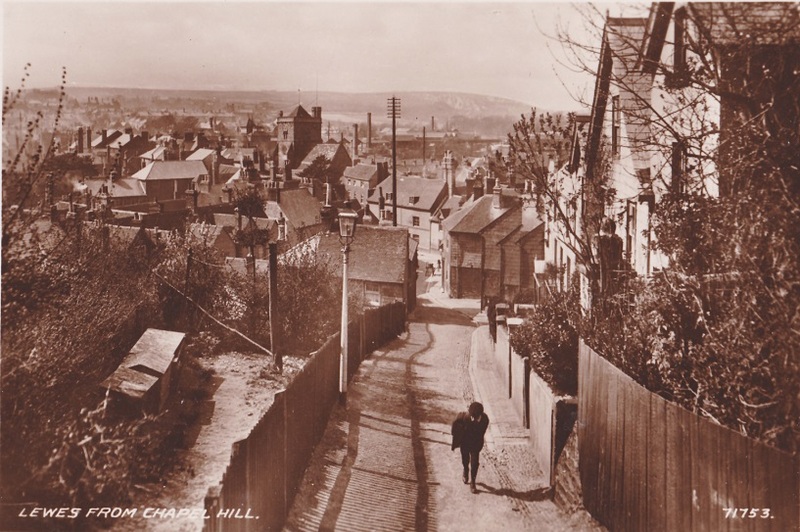 19 & 20 Chapel Hill, which have replaced the former Elm Cottage, Hillside and Rock Cottage/Cliffe View. The land on which Nos. 19 & 20 were built was purchased in the 1960s by Eileen Chandler, wife of Teddy Chandler of the Builders’ Merchants. She commissioned the building of these two houses and was herself living in the upper one, No. 20, when it was purchased by the current owners ten years later in 1976. (It was they who later added the ‘tower’ extension and a redeveloped car port with garden above.) A Roger Bullock purchased No. 19 and lived there with his mother. The current owners purchased the house from him in 1987 – on Bonfire Night! 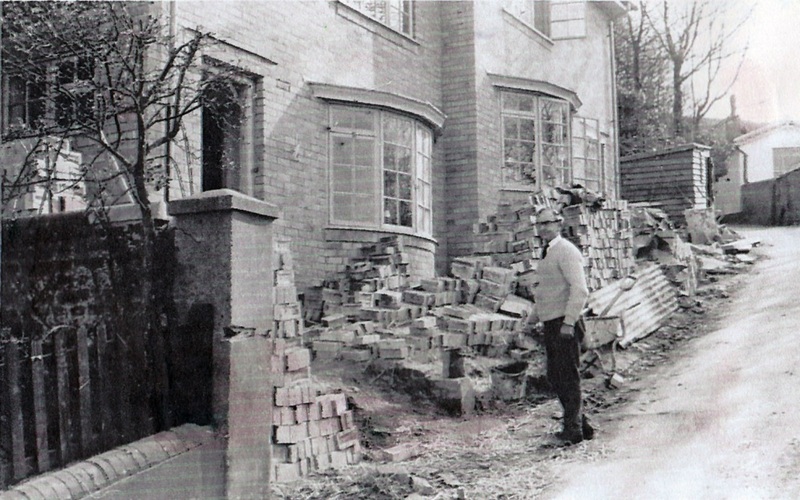 The photograph below is of the building work carried out for Nos. 19 & 20 for Mrs Chandler by Peter Shepherd and his father. During the building, Peter Shepherd became aware of a plot of land opposite, on the site of the former Cricketers’ Arms. He purchased the land and, with the help of his wife who still lives there, constructed his own home. This photograph shows the true feat of construction on the steep cliff slope. The building of the house was completed in 1969 and aptly named ‘Sycamore’ after the huge tree adjacent (a notable landmark). Over the years many pieces of glass and china have been found on the property, clearly dating to the time of the alehouse. The photograph on the right is of Sycamore (No. 23a) from the road today. Above Sycamore are two further properties, the first, almost adjacent, known originally as ‘Prospect Cottage’, a notable presence in several contemporary paintings and maps. Today it is best viewed from below, its large west window showing above the wall and gateway. Prospect Cottage was owned and occupied by members of the Penfold Family as recorded in the 1891 census until 1940. By 1900 they had renamed the house ‘Southdown Cottage’ and since 1901 it has been recorded as No. 23 Chapel Hill. A Miss Sylvia Mann who purchased the house in the 1970s did considerable work to terrace the large sloping garden running down the cliff. 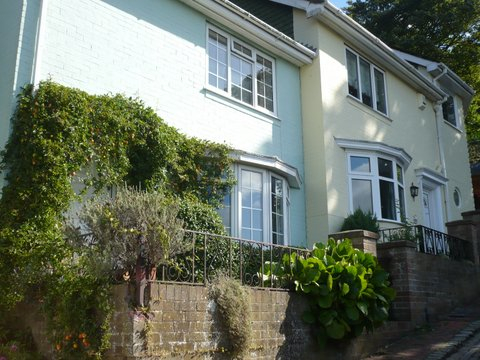 A daughter of the Penfolds married Mr Harry French (mentioned in the Introduction in connection with the Golf Course) who in 1934 built on above Southdown Cottage an adjoining house for himself and his wife. At first this had interconnecting doors, though the 1936 Street Directory shows that by then the two houses had been made separate. His house is now No. 22. This photograph shows the present day house with No. 23 below. Harry French terraced his garden and ran a market garden business from there. 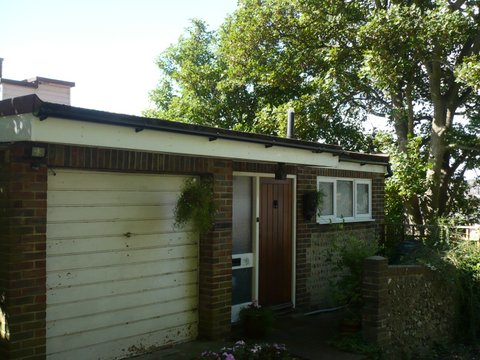 He also bought from the Firle Estate the wood extending along above South Street. It still belongs to the property. In 1949 he and his wife moved to Brighton, selling the house to a Miss Waldo who bred canaries and painted the front door yellow. ‘Canary Cottage’ was still the name when bought by the current owners in 1978. They have re-instated a lot of the original neglected terraces from the market-garden days. One of their early memories from living on the hill is the strong smell of sulphur coming up from the Cement Works below. Since their ownership Dutch Elm Disease and the storm of 1987 have destroyed many of the trees in the wood.